Even designers with the keenest eye for detail and an inside-out understanding of colour theory will have struggled to identify the right hue at some point of their careers. To make the process of finding swatches and their equivalent colour values easier, Pantone has updated its Color Finder tool. With controls that enable users to pick, search and convert colours, the new and free Color Finder is a comprehensive and intuitive way to sift through Pantone's chips. Wave goodbye to using a gradient bar to hazard a guess as to the right colour, simply start clicking samples and narrowing down the search fields. These parameters include Pantone Matching Systems for graphics, interiors, skin tones and much more. Colours can also be narrowed down by hue groups and smooth orders. Thanks to the search bar and convert fields, users can find colours by their name, sRGB, HEX, and CMYK codes as well. Once you've settled on a colour, you can click on the swatch to find its exact RGB, HEX and CMYK values. Pantone will also helpfully recommend which samples you should purchase from its collection. 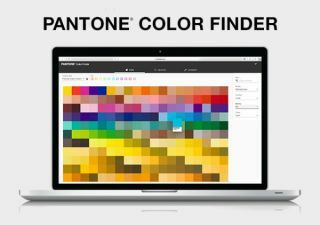 With an in-depth array of search options now bundled into one place, Pantone's Color Finder promises to be a real time-saver, and judging by its enthusiastic reception on social media (check out those Instagram comments), it looks like this is the tool a lot of designers have been waiting for. Are you ready for Pantone: The Game?